The Wedding Quilt Saga - quilted! I spent the day quilting the quilt with a couple of big chunks of time taken out for things I had to take care of. Originally I had hoped to get it done early enough to be able to wash it Tuesday evening and let it dry overnight on Wed. on the table. But that's not going to happen. I will wash it on Wed. morning and let it hang dry outside. I can get pictures then too. I feel like I've been going a mile a minute and it's not been necessarily how I prefer to sew! Here are a few pictures from the process of quilting. I really was working hard and didn't take time off to take pictures! I did the walking foot quilting first and then went back and did the free motion quilting second. I'm never quite sure what to do with the free motion quilting - though I tried some things I've never done before today. Which were new to me? Well, the double feathers - that was a necessity as my single ones looked sick. I decided to "throw more thread at it" as I've heard on you tube videos and make them doubled and they were okay then. I've also never done those circles around the checkerboard squares. I finally figured out to do them efficiently towards the end of the 20 Ii did! Am I entirely pleased? With the quilting, no.I never am. 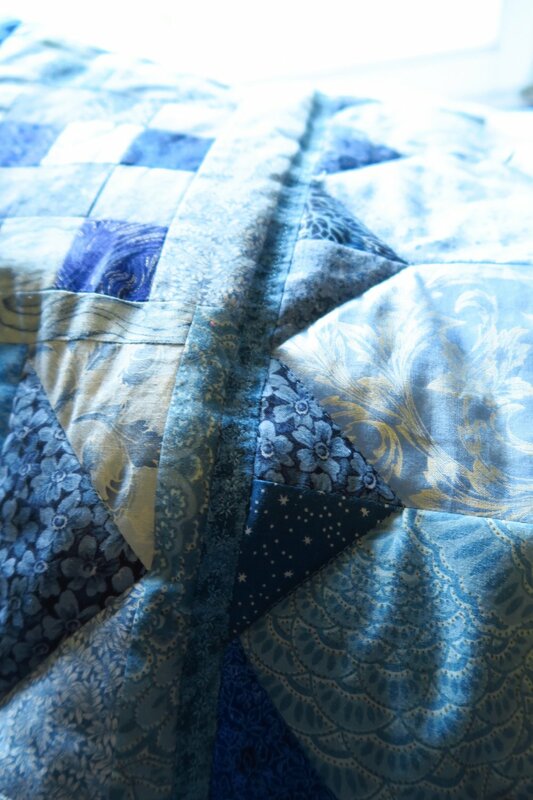 But in the end, the quilt will be a nice present - and as we quilters know - we are always hardest on ourselves. As I mentioned before, I hope to get the quilt washed first thing in the morning and then let it hang outside to dry where I can get natural light pictures. That will be really nice! My LED and fluorescent lighting really does weird things sometimes with color! The only thing I have left to do is they've asked me to make a label of sorts with the name of the couple and the date of the wedding. So, I need to plan that out, embroidery it and then hand sew it to the back of the quilt. I'll do that while it's drying, Maybe I can finish the embroidery while it's still in the washing machine (our short cycle takes 1 hour 35 min). I also would love to make 2 or 3 decorator pillows to go with the quilt - from bonus triangles and the leftover checkerboard pieces. They are kind of fun to make. and I can send the empty pillow with the quilt. They should be able to find a different pillow they can stuff inside it! Thanks for taking this journey with me. I've been pretty pressured to get this done - and when my husband leaves with the quilts in his suitcase I'm sure I'll crash! She has put up some really pretty fabrics lately! Be sure to check out the "new" category regularly! Just put in how many dollars you need to pay as instructed in your email MINUS $5, as the $5 shipping charge is automatic.